With the arrival of a team led by former Sri Lanka captain Sanath Jayasuriya in Karachi, international cricket of sorts is set to return to Pakistan. 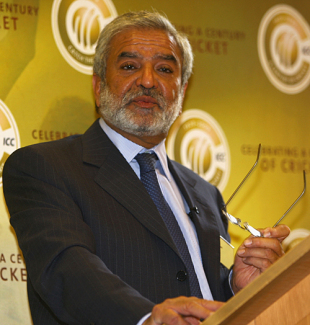 Ehsan Mani, the former ICC chief, feels that though the two matches to be played this weekend will boost Pakistan's reputation as a viable host for international cricket, they won't be enough to convince Test teams to play in the country yet. The International XI includes South African fast bowlers Andre Nel and Nantie Hayward, and West Indies players Jermaine Lawson and Ricardo Powell. They face a Pakistan All Stars XI team in Twenty20 matches at the National Stadium in Karachi on Saturday and Sunday. There has been no international cricket in Pakistan since March 2009, when the Sri Lankan team bus was attacked. "I do not think that these matches will have an immediate impact in persuading ICC Full Member teams to tour Pakistan but it is a step in the right direction," Mani told ESPNcricinfo. "The International XI is a small but significant step in the confidence building process to assure overseas players and teams that Pakistan is open for cricket and it is safe for overseas players to come to Pakistan." Without doubt Pakistan is desperate and in need of international cricket in their backyard; youth development is on hold as no team even at the youth level is ready to tour, the PCB has suffered a budget deficit for years, stadiums are getting rusty, fans are deprived. At a time when Pakistan is a no go-area for major international teams, though a side comprising international players have arrived in the country, the PCB has disassociated itself from the tour. They have stressed that the games are unofficial and are unsanctioned, and have left Sindh sports minister Dr Mohammad Ali Shah to deal with most of the arrangements. "I was disappointed to read that the PCB had disassociated itself from the matches; it appears that PCB is covering itself in case something goes wrong," Mani said. "This gives totally the wrong message. The PCB should have been very much involved, including assuring itself that adequate security arrangements are in place. It is disgraceful that the initiative to convince players to come to Pakistan is not being led by the PCB but by the Sindh government. "The PCB's approach to bringing international cricket back to Pakistan is flawed," Mani said. "It tried to first persuade and then bully Bangladesh to tour Pakistan. The PCB does not seem to understand that before a full international tour can take place, teams such as the International XI should tour Pakistan to provide a degree of comfort to the ICC Member countries." Pakistan cricket chief Zaka Ashraf, though, has said the revival of international cricket is his top priority but apparently accepted the goal is tough to achieve in the near future. While talking to ESPNcricinfo last month, he called the approach of the cricketing world towards touring Pakistan as 'rigid'. Mani said the PCB needed to be fully aware of the steps necessary for the return of international tours to the country. "The PCB clearly does not understand the politics of cricket and the pressures on certain countries not to tour Pakistan by others with a different agenda. "The PCB also does not appear to have agreement with the ICC on what assurances the ICC will require before a team and ICC officials consider it safe to come to Pakistan," he said. "It does not help that no PCB official or member of the security agency mandated to provide security to the Sri Lankan team in 2009 has been made accountable and punished for the disastrous lapse of security which put at risk the lives of players and officials and cost the lives of security personnel and destroyed international cricket in Pakistan."